Interested in the magnesium space? In this overview, learn what’s in store for the magnesium outlook in 2019 and beyond. At the end of 2017, magnesium was expected to experience steady, moderate growth over the next two years. And for the most part the metal, which is used as an alloy, did just that in 2018. Despite being fairly uneventful for prices, the last 12 months have included some excitement for the magnesium sector. The multi-functional element was added to a list of US critical minerals during the year, and reduced supply out of China helped move magnesium prices higher. 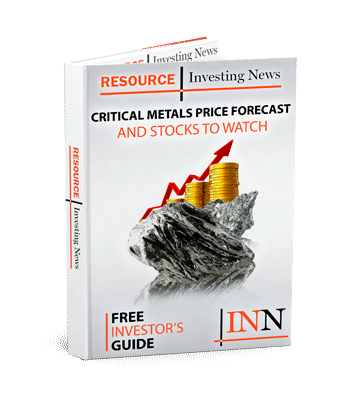 In the article below, the Investing News Network examines what catalysts occurred in the magnesium industry during 2018, and explores the magnesium outlook for the year ahead. One of the factors that has helped spur price growth in the magnesium sector is decreased supply, primarily from China, the world’s top producer. It is estimated that China’s refined magnesium output this year will reach 850,000 metric tonnes (MT), down from 2017’s number of 1.022 million (MT). The output drop from the top producer comes on the back of more stringent environmental regulations around the country’s mining and extraction sectors. Roskill’s 2018 magnesium report highlights China’s ongoing environmental targets. “President Xi Jinping is focused on pollution control as well as economic growth for his second term, with implications for the global supply chain in magnesium compounds as well as many other industrial raw materials,” it states. “Magnesia prices in China in Q2 2017 tripled over those seen in Q1 2017 and stayed at US$630-740/t for 97.5 percent MgO, lump DBM, FOB China into the Chinese New Year in February 2018,” it continues. Part of the ongoing issue with magnesium production is the coal used for powering the smelters used to make it. Crackdowns on emissions and pollution are keeping China’s output down. From January to July, China put out 436,600 MT of refined magnesium, down 21.89 percent year-on-year. Production is unlikely to ramp up due to the restrictions and output cuts China has enacted on its coal sector, which will last well into the winter months. In May, the US Department of the Interior named 35 minerals it deems critical to national security. While obvious resources like uranium, titanium and tin made the list, magnesium was also added. Currently, the majority of US magnesium is imported from China; however, the US does not want to rely solely on supply from the Asian nation, especially as tariff and tax wars escalate. Issues of national security have also been raised regarding the versatile element — while magnesium is used in everything from batteries to fertilizers, some is earmarked for the aerospace sector. But China wasn’t the only country to be examined by the US in relation to magnesium imports. The commission found there is a reasonable indication that the local magnesium industry is being hurt by imports from Israel and unfair subsidies. Moving forward, US magnesium companies would like foreign imports to be taxed more and domestic quotas to be established. While American producers grappled with foreign competition, Canadian explorer West High Yield Resources (TSXV:WHY) found the permitting process the most challenging aspect to getting its magnesium project in BC off the ground. Despite the difficulties associated with the process, West High Yield still had an eventful year. Implementing green initiatives globally will take some clever thinking and non-traditional resources. While most people think about green energy in terms of nuclear, wind or solar, there are also ways to look a building materials with more of a green focus. Magnesium cement is one of those materials, according to West High Yield’s Marasco. One tonne of magnesium cement has the ability to absorb as much as 100 kilograms more CO2 than it produces, and takes 30 percent less energy to produce than other types of cement. As one of the most versatile minerals, it’s easy to see why Marasco is so excited by its potential. Magnesium prices are expected to climb in 2019 due to reduced supply and residual output cuts. Production for 2017 was down roughly 9,000 tonnes from the previous year, and ongoing production disruptions will likely drive that number even lower this year. Demand from various industries, including the agricultural sector, is forecast to incrementally grow over the next five years, forcing prices higher moving forward. Editorial Disclosure: West High Yield Resources is a client of the Investing News Network. This article is not paid-for content.